If you like to save time in the kitchen, but still put a great meal on the table for your family, a pressure cooker is a great option for you. Cooking with pressure allows you to cook all kinds of foods up to two-thirds faster than other cooking methods. Plus, it will leave your food more tender and full of nutrients. Did you get that part? “two-thirds FASTER”. Check out how I made homemade applesauce in one minute. As a mom of 3, my slow cooker was my savior. A busy day for us was spending a couple hours taking kids to and from school, cleaning house AND working from home. Not to mention, making sure there was a meal available for the boys (who eat EVERYTHING.) It was nice to know that I could throw some things in the slow cooker and 8 hours later have a meal. Oh, wait… but I forgot to turn it on. …or I might have gotten so busy that I forgot the food needed 8 hours to cook and it’s already 1pm! Has that ever happened to you? Thankfully, my electric pressure cooker can make those meals in about an hour. So you might be wondering, How Do Pressure Cookers Work? A pressure cooker works with steam pressure. When cooking, you use a pot that is sealed tight. Heat is used along with the liquid in the pot to build up steam. You trap the steam inside so that it builds up a high pressure to make food cook faster. It is amazing how much quicker you can cook all types of food. It also traps all of the flavor, moisture, and nutrients leaving you with tender and flavorful food. A pressure cooker is an aluminum or stainless steel cookware item that has a lid that locks on tight, and a vent or some sort of pressure relief valve. 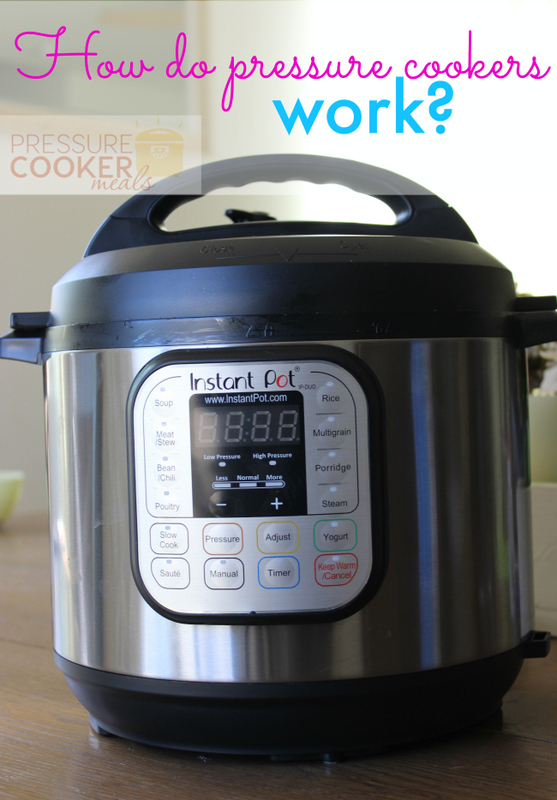 You can buy pressure cookers that are used on a stove or electric models, like the Instant Pot. My personal favorite! Using a valve to control the steam pressure, the pot will heat up and steam will form from the liquid inside the pot. When the steam forms the pressure inside the pot increases. 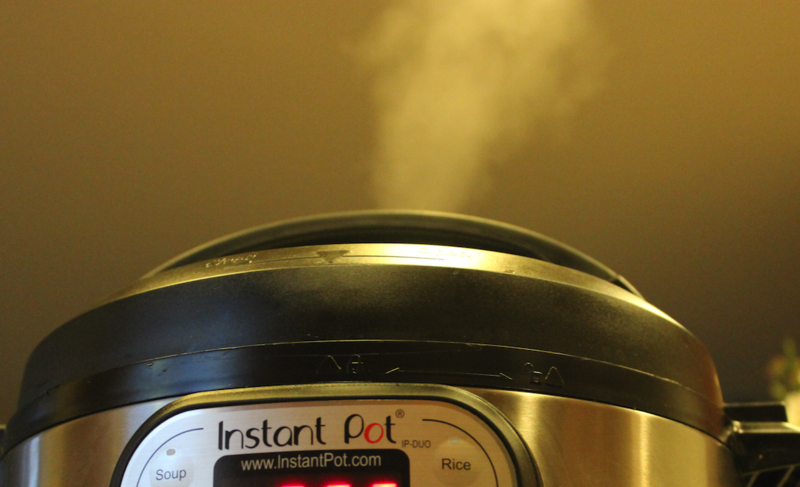 The pressure inside the pot actually forces the steam through the food to cook it evenly. To create the pressure needed to cook at this speed, you will need to boil a liquid in the pot to create steam. This liquid can be water, a broth or other liquids used in cooking. Using the steam’s pressure, you can now cook with a boiling point of up to 250° F versus 212° F using the stove. The higher heat allows the food to cook a lot quicker. The pressure created within the pot also will force liquid into the food you have inside the pot. This not only allows the food to cook faster, it makes it very tender a lot quicker as well. The moisture trapped inside will keep everything from getting dry and tough, and will keep it moist and tender. Most foods cooked in a pressure cooker require you to heat up the cooker, add the food you are cooking, put on the lid, adjust the pressure level and cook for a certain amount of time. Once that time is up you need to let the pressure release. This can be done quickly or slowly, depending on what you are cooking. A pressure cooker can speed up cooking times by up to two-thirds the normal cooking times, plus it will use about 70% less energy because you are cooking the food for a shorter length of time. What a great way to save time and money in the kitchen! You can also save money by using a pressure cooker by using cheaper cuts of meat and dry beans instead of canned. The way the pressure cooker cooks the food will give you fast and tasty results with cuts of meat that are normally tough and dry bean that normally take much longer to cook. Pressure cooking is a great way for busy people to be able to cook a great meal in a short amount of time, and for cooking a large variety of foods from vegetables to meat.